As there are 4.3 million chips in play, there are just 43 big bets in play now! From the cutoff Ashly Butler raised to 80,000 and Gavin Griffin called from the big blind. On a flop Griffin check-called a 40,000 chip bet. The turn was the and Griffin check-called 80,000. On the river the showed up and Griffin check-called another bet. Butler showed for the nut full house and a low. Griffin mucked and Butler raked in a nice pot. A couple of hands later John Racener raised under the gun to 80,000 and Griffin defended from the small blind. The flop came down and Griffin lead out for 40,000, Racener called. The turn was the and Griffin bet 80,000 after which Racener made the call once more. On the river the hit and Griffin checked to the 2010 WSOP Main Event runner up who bet 80,000. Griffin called and was disgusted when he saw Racener turn over for a pair of kings and the nut low. Griffin had for the same low but only got a quarter of the pot since he couldn't beat the high hand. Griffin is slipping while Butler and Racener are regaining some ground in this hard fought battle for the gold! John Racener seemed to be upset with himself after he lost a pot to Herbert Tapscott. Racener raised from the cut-off and was only called by Tapscott one seat along. The flop came down and Racener continued for 40,000. Call. The turn and river were checked through and Tapscott opened . Racener shook his head and folded. Can Kim Hua raised to 80,000 from the hijack and John Racener made the call from the cutoff. Herbert Tapscott called from the button and both blinds folded their cards. The flop came down and Hua checked to Racener who bet 40,000 and got called by both his opponents. The turn was the and Hua checked again. Racener threw out 80,000 with very little behind but he got no action. Tapscott is really short once again while Racener is back in the hunt. 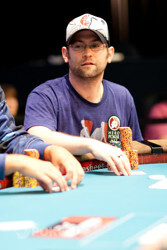 Gavin Griffin is the chip leader and using his stack to pile pressure on his short-stacked opponents. He's opening most pots that are folded to him. when he raised off the button John Racener defended his big blind to see a flop. He check-called a bet here and on the turn before both players checked the river. Griffin tabled for two-pair. Judging by Racener's reaction we think he was rivered by Griffin. 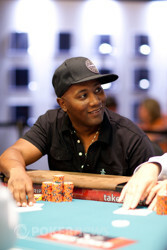 Herbert Tapscott just lost a pot against Gavin Griffin knocking him all the way down to just 75,000 chips, but shortly thereafter he found a spot to triple up. In the first hand Griffin raised to 80,000 from the cutoff and Tapscott called from the big blind. The flop came down and both players checked. On the turn, the , both players checked again. The river was the and Tapscott double checked his cards before betting 80,000. Griffin called and Tapscott mucked his hand immediately. Griffin had to show and tabled for a pair of fives and a low. Two hands later Tapscott was on the button and called all-in when John Racener had raised it up to 80,000. Rasmussen called as well and on a the hand got checked out. Racener showed and with two pair he took the small side pot from Rasmussen. Tapscott showed for the wheel and he scooped to main pot in order to stay alive in this tournament. John Racener will feel a lot better about life after he doubled through Gavin Griffin. He was on the button and called a raise from Griffin. From there he took over the initiative and bet all the way down the board. Griffin check-called all the way. Griffin for no part of the pot. Thayer Rasmussen has taken care of Raymond Davis in 8th place. Davis called all-in for his last 10,000 after Rasmussen raised to 80,000. 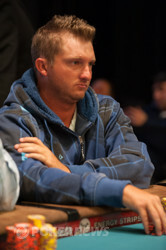 Michael "Boonie" Kleist came along for the ride but folded when Rasmussen led for 40,000 on the flop. Rasmussen: for the nut flush. "Wow, I'm in better shape than I thought!" said Davis. He needed the board to pair but it failed to do so as it ran out . "It's Hard to Kill a Man From Alabama"
John Racener opened up the action with a raise to 80,000 and Herbert Tapscott called all in for 65,000. Thayer Rasmussen called in the cutoff and the remaining players folded. The flop came down and both Racener and Rasmussen checked. The turn and river, the and , got checked as well and we got to see a a three-way showdown. Herbert Tapscott showed for the nut flush and he took down the main pot. The small side pot was for Racener who showed and Rasmussen showed his before mucking his cards. "It's hard to kill a man from Alabama," Ashly Butler said to Tapscott who smiled, nodded and stacked his chips. We are still with eight players. We still have eight players remaining in this event. The blinds and limits are very high now so expect the eliminations to come thick and fast. Play will resume at 9:15pm local time. See y'all in one hour. A Pot, and It's Not a Chop! I was beginning to think this game was all about chopped pots as no one could win one outright, until now that is. Thayer Rasmussen was all-in for his remaining 55,000 and was called by Gavin Griffin, and Can Kim Hua. Griffin and Hua were both happy to check the board all the way down. Rasmussen: for two-pair and the pot. We are seeing a lot of chopped pots as of late and the short stacks are surviving. Both Thayer Rasmussen and Herbert Tapscott survived their all-ins and we are still with eight players. We will be on a one hour dinner break in 17 minutes. Can Kim Hua had the best of Bryan Jolly all day and he just busted him in 9th place. First Jolly limped for 30,000 and Hua called from the button. Tapscott folded his small blind after which Butler checked his option in the big. The flop came down and Butler checked to Jolly who bet 30,000 and both his opponents called. The turn was the and both Butler and Jolly checked. Hua bet 60,000 and Butler went in the tank. After a good minute he folded and as soon as Jolly released his hand Butler said, "I made a big lay down. I had queen-nine of spades". Jolly was left behind with very little chips and a few hands later those went into the middle. On a flop Jolly bet 30,000 with 10,000 left behind, and Hua put him all in. Jolly made the call and showed for a pair of aces and a back door flush draw. Hua turned over for a pair of kings, the nut flush draw and a straight draw. The turn was the completing Hua's flush and the river was the . That's was it for Jolly who got to take $18,837 home for his efforts. Can Kim Hua took anther pot off Bryan Jolly and then gave them straight to Michael "Boonie" Kleist. He called Jolly all the way down a board and then raised the river. Jolly wasn't happy but made the call to be shown for a straight. His was only good for a quarter of the pot. Gavin Griffin raised to 50,000 and Ashly Butler called from the big blind. The flop came down and Butler check-raised the 25,000 bet to 50,000. Griffin called. The turn was the and Butler bet 50,000. Griffin called once more. On the river, the , Butler bet 50,000 and Griffin made it 100,000. Butler tanked for just a few seconds and made it 150,000. Griffin snap-called and both hands got tabled. Butler showed against Griffin's . Both players had the nut low but Butler took down the high with a full house.